Most dessert recipes make enough for a crowd. Now I’m not saying that’s a bad thing. Not at all. But there are times when you just want enough dessert for two. Whether it be Valentine’s Day, an anniversary, or just to cap off a special dinner. Recently Quinn and I had a long overdue lazy weekend. No big projects, minimal work to do, snow outside. In other words, it was the perfect time to just hibernate a bit and spend some time together. I, of course, wanted to add a special dessert to at least one of our meals. That’s where these bread puddings come into the picture. They are, without a doubt, one of my favorite desserts I’ve made in recent memory. 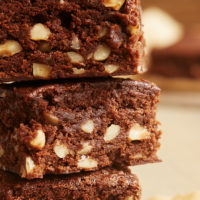 The combination of bourbon, chocolate, and nuts is a favorite, and it works so amazingly well here. We both absolutely adored these. And with how simple they are to make, it’s a double win! 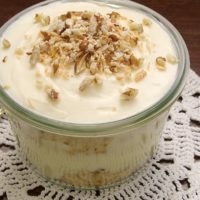 Other than getting some bread to use for these puddings, I had everything I needed to make these already in my kitchen. Milk, eggs, sugar, chocolate, and pecans are definitely staples around here. And I just happened to have a bottle of bourbon for times like these. I had these little guys prepped and chilling in less than 10 minutes. How great is that? You’ll need to chill them for a bit before cooking them, but that just means you have to plan ahead a bit. Get them assembled in the morning or even the night before you’ll be serving them. Then just pop them in the oven and you’re done. And if you need to serve more than two, just scale the recipe. A lot of bread puddings have a sauce or glaze on them. But these really don’t need anything else. The flavor is amazing just as they are. And you’ll keep the simple-to-make characteristic firmly in place by serving them without anything extra. Place the bread, pecans, and chocolate in a large bowl. 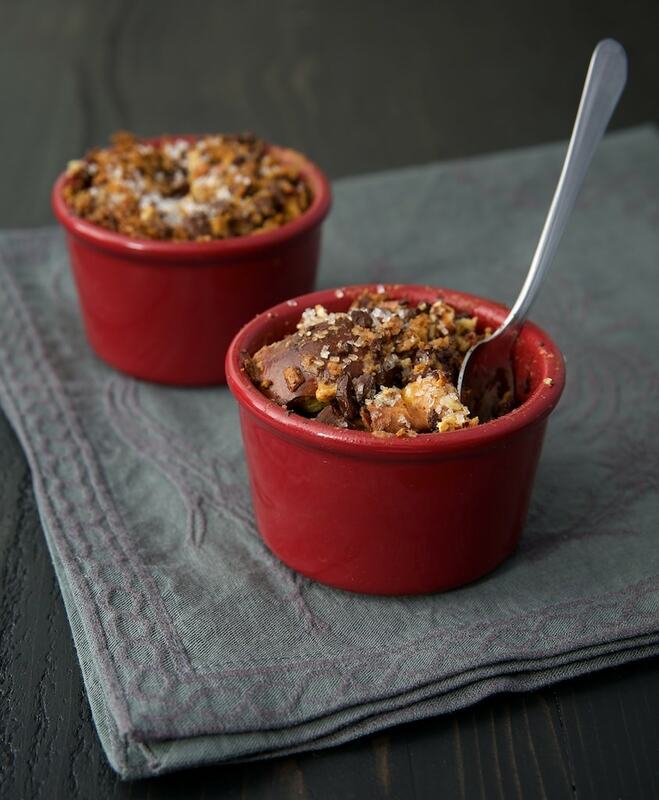 If desired, set aside about a teaspoonful of pecans and chocolate for topping the bread puddings. Whisk together the milk, brown sugar, egg, bourbon, and vanilla. Pour over the bread mixture, and stir to combine. Make sure all of the bread gets coated with the milk mixture. Lightly grease two 8-ounce (1-cup) ramekins. Divide the bread mixture between the ramekins, packing the mixture firmly to fit into the ramekins. If you reserved some pecans and chocolate, sprinkle on top of the puddings. Sprinkle each with about 1/4 teaspoon of sanding sugar. Cover and chill for at least an hour or overnight. Place the ramekins on a parchment-lined baking sheet to catch any spills and to make it simpler to get them in and out of the oven. Bake 30 to 35 minutes, or until the tops are browned and a knife inserted into the center comes out clean. 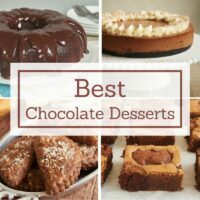 Love your desserts but I find I can’t eat most of them as they are high carb and not gluten free. Every once in a while, I would very much appreciate a dessert or two that used coconut sugar and was gluten and lower carb. ooooh i love that there are pecans in these too! 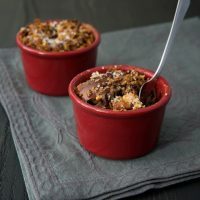 chocolate bread pudding is one of my faves! Mmm loving the combination of dark chocolate, vanilla AND bourbon. Definitely a good call making a decadent dessert for only two servings. Yum! I love bread pudding and this one has got to be one of the best sounding ones ever! Dark chocolate and bourbon? I have got to make this gem of a recipe. This combines three of my favorite things! I could eat bread pudding every day forever, and now I’ll definitely be adding some bourbon! Bread pudding is one of my top three favorite desserts: it’s so cozy. 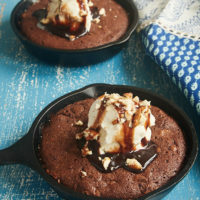 I love this combination of chocolate, pecans and bourbon. Wonderful! Yummy Dark Chocolate and bread pudding. Sounds decadent and delish! Pinned. Chocolate AND bourbon. Yes please! Do I have to share?? 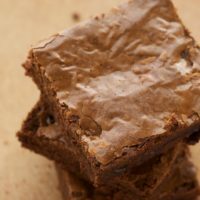 Bourbon is not just my favorite sipping liquor, it’s one of my favorite liquors to bake with too! This looks delicious! Challah makes the best bread pudding!And with bourbon and dark chocolate, I can hardly imagine a better cozy dessert-for-two. My Louisiana roots are just screaming for me to make this ASAP! 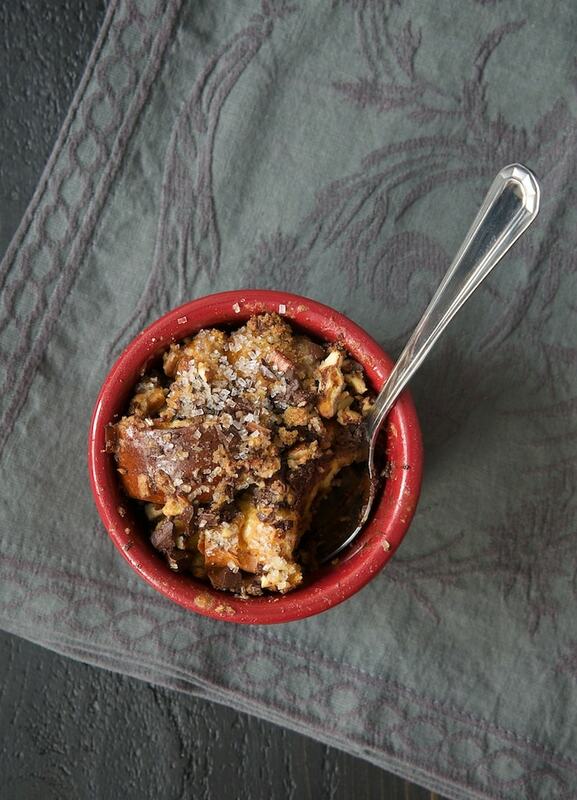 Chocolate, bourbon, AND bread pudding? I’m in love. Love all your recipes, but let us see something in the way of a meal. I am always excited for bread pudding! Though, I can’t control myself around it so these portion-controlled servings are KEY. Seriously, seriously good stuff!! 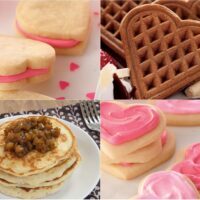 I made these for me and my husband today (like you, we’re not exactly into the V-day thing, either, but a fancy dessert is definitely in order!). We can’t get challah bread here, but I found a dense, slightly sweet bread and it made the perfect substitute. This could be the perfect base for other bread puddings, to use other liqueurs, chocolate, or nuts in. Excellent recipe, once again! We really, really liked these, too, Kendall! Glad you two liked them! I made this for our Valentine’s dinner and it was great! All I had on hand was sourdough which is not my first choice for bread pudding but it still turned out really well. I also used walnuts instead of pecans. Thanks for the recipe!